GNOME Shell, with lots of changes in the desktop environment. Debian 8 (Jessie), which upgrades most included software and improves many things under the hood. This release fixes many security issues and users should upgrade as soon as possible. Cosa arriverà nelle prossime versioni? Tails now uses the GNOME Shell desktop environment, in its Classic mode. GNOME Shell provides a modern, simple, and actively developed desktop environment. The Classic mode keeps the traditional Applications, Places menu, and windows list. Accessibility and non-Latin input sources are also better integrated. To find your way around, read our introduction to GNOME and the Tails desktop. Many core GNOME utilities from 3.4 to 3.14: Files, Disks, Videos, etc. Remove the Windows camouflage which is currently broken in GNOME Shell. We started working on adding it back but your help is needed! Sandbox many services using Linux namespaces and make them harder to exploit. Make the launching of Tor and the memory wipe on shutdown more robust. Sanitize our code base by replacing many custom scripts. Update most firmware packages which might improve hardware compatibility. Notify the user if Tails is running from a non-free virtualization software. Remove Claws Mail, replaced by ?Icedove, a rebranded version of Mozilla Thunderbird. Close Vidalia before restarting Tor. For more details, see also our changelog. Tor Browser 5.5 introduces protection against fingerprinting but due to an oversight it is not enabled in Tails 2.0. 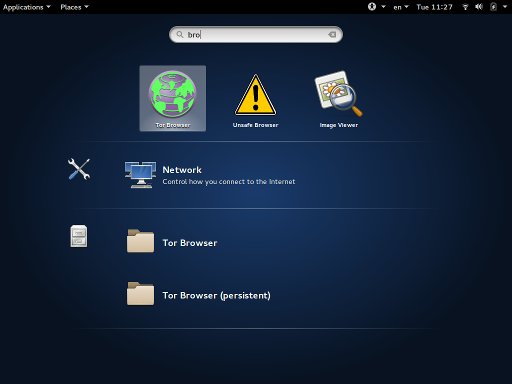 However, this is not so bad for Tails users since each Tails system has the same fonts installed, and hence will look identical, so this only means that it's easy to distinguish whether a user of Tor Browser 5.5 uses Tails or not. That is already easy given that Tails has the AdBlock Plus extension enabled, unlike the normal Tor Browser. See the current list of known issues. We also redesigned completely our download and installation instructions to make it easier to get started with Tails. For example, you can now verify the ISO image automatically from Firefox using a special add-on. You can also install or upgrade Tails directly from Debian or Ubuntu using the tails-installer package. Try our new installation assistant. Tails changed so much since version 1.8.2 that it is impossible to provide an automatic upgrade. We recommend you follow our new manual upgrade instructions instead. The next Tails release is scheduled for March 6. Dai uno sguardo alla roadmap per sapere a cosa puntiamo. Ci serve il tuo aiuto e ci sono molti modi in cui puoi contribuire a Tails (donare è solo uno di questi). Vieni a parlarci!